Conventional wisdom suggests that the vagrants are starving juveniles who weren’t able to compete for limited food resources in their usual territories and headed south to try their luck in generally Snowy-free areas. But new research, published in The Auk, suggests that this narrative may not provide the whole story. 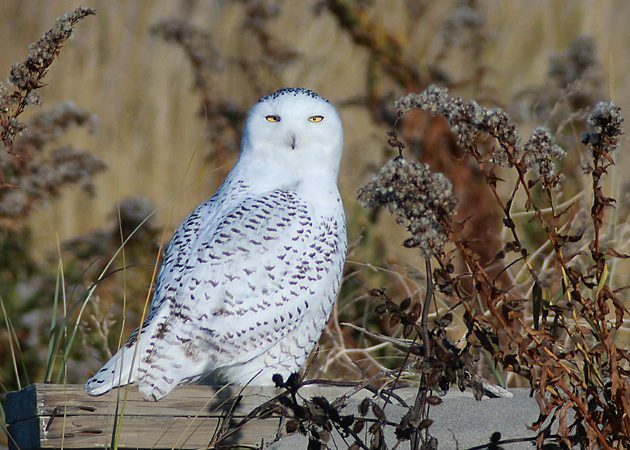 Scientists studying Snowies wintering on the prairies of Saskatchewan, Canada found both younger and older birds whose overall condition was generally pretty healthy, with few signs of starvation and even some weight gain during the winter months. It may be too early to speculate about how Snowy this winter may be in North America. But if you’d like to follow the latest in tracking and forecasting, a good source is Project SNOWStorm. Just tell them Hedwig sent you.